The jackpots listed on this page can be played at casinos that feature progressive games from Microgaming. We have been tracking their jackpots since December 2009 and currently monitor 16 of their jackpots in total. 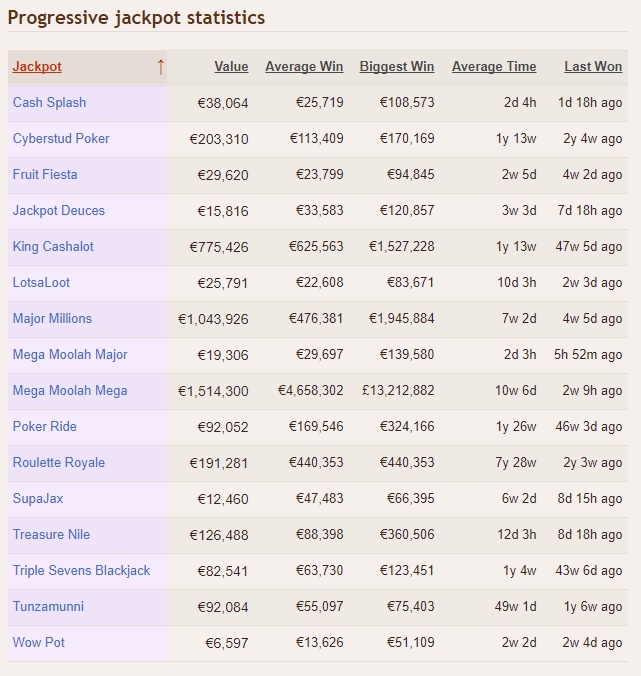 Having paid out more than half a billion euros to date, our progressive jackpot network is easily the largest in the world. But it’s the diversity and playability of our progressive range that players find so appealing. The progressive jackpots at casinos that use Microgaming software are linked between all casinos on the network. This means that the jackpots have a large number of players contributing to the pools across a wide range of casinos. The end result is that the jackpots accumulate relatively quickly and are won often. An interesting thing to note is that the jackpot number is not adjusted based on most major currency exchange rates. So for example if you win a million credits jackpot while playing in Pounds Sterling you are paid in Pounds Sterling, while if you were playing in Euros you would be paid one million Euros. The most prestigious Microgaming jackpot is undoubtedly Mega Moolah. This colossal jackpot may be won while playing a variety of different slot machines that all contribute to the pool such as Mega Moolah, The Dark Knight, Mega Moolah Isis, Mega Moolah Summertime and Mega Moolah 5 Reel Drive. The biggest Mega Moolah win so far was taken home by a Greek gentleman who pocketed a cool €6.3 million and change in mid 2009. Many of the Microgaming slots jackpots are available in both classic 3 reel and also 5 reel video slot variants. The chance of winning the jackpot is the same regardless of which machine you pick, so you can choose according to your taste.